Our Hometown Hero of the week is Austin Johnson a firefighter and EMT in Four Oaks. 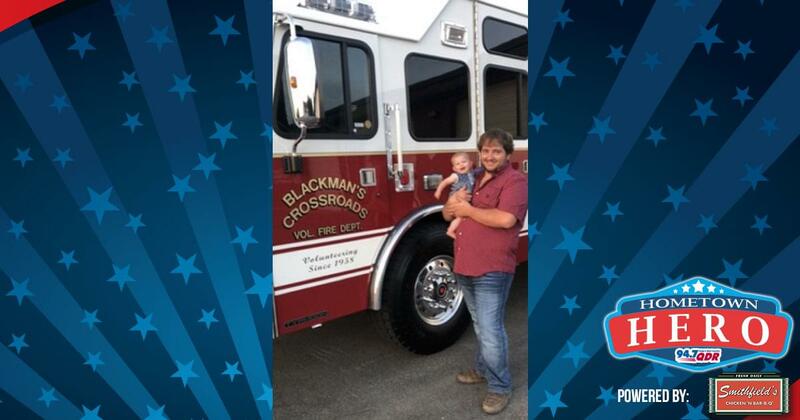 Austin was nominated by Lindsay Johnson who shared: He’s been a volunteer firefighter and EMT at Blackmans Crossroads volunteer Fire Department where he’s been serving since 2010, and is now Assistant Chief. He is the type of guy who wants to be friends with everyone and is always willing to help others. This definitely shows when serving his community. I want to say thanks for all you do! You will always be mine and Raleigh’s hero! Thank you Austin for your service! We’re sending you a gift card to Smithfield’s Chicken ‘N Bar-B-Q to thank you for all you do!